• 1. Combine all ingredients in a cocktail shaker and shake with ice. • 2. Strain into a rocks glass. • 3. 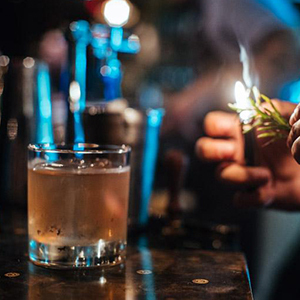 Garnish with a charred rosemary sprig. • 1. 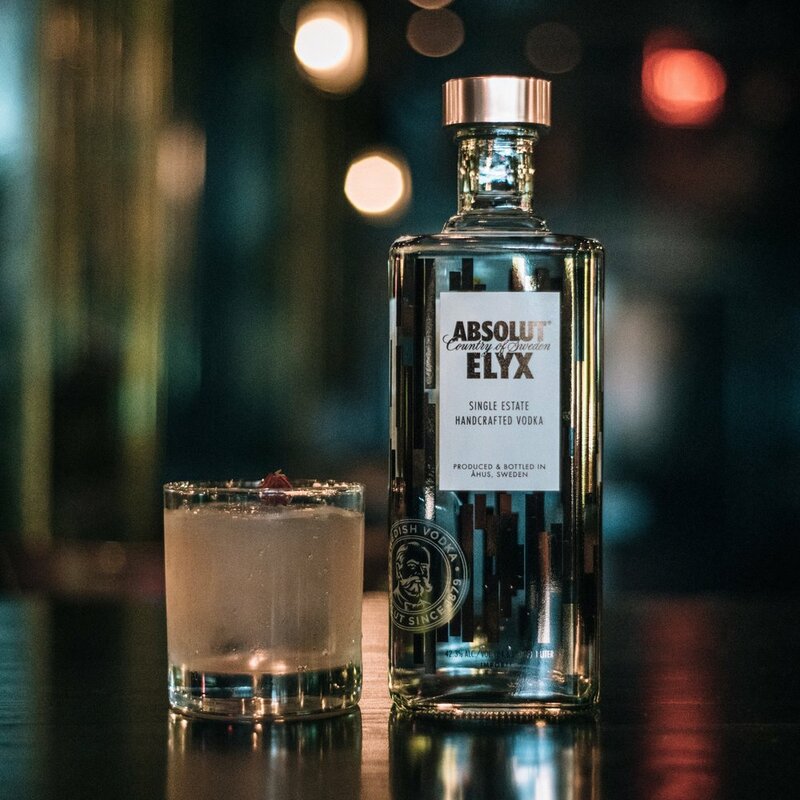 Combine all ingredients in a mixing glass over ice and stir until chilled. • 2. Strain over ice into a brandy snifter or rocks glass. • 3. Garnish with a stalk of lemongrass. • 2. Strain into a collins glass. • 3. Top with San Pellegrino Blood Orange Soda. • 2. Strain over crushed ice into a brandy snifter. • 3. Garnish with a sprig of sage and an orange wedge. • 1. Combine all ingredients in a cocktail shaker and reverse dry shake. • 2. 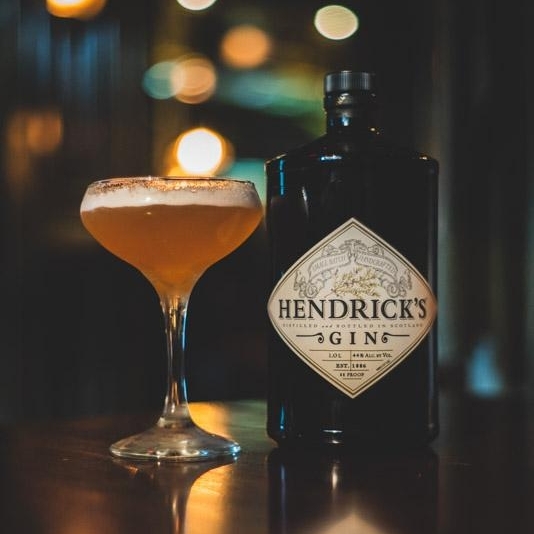 Strain into a Herbsaint rinsed coupe glass. • 3. Garnish with 3 dashes Angostura bitters. • 1. 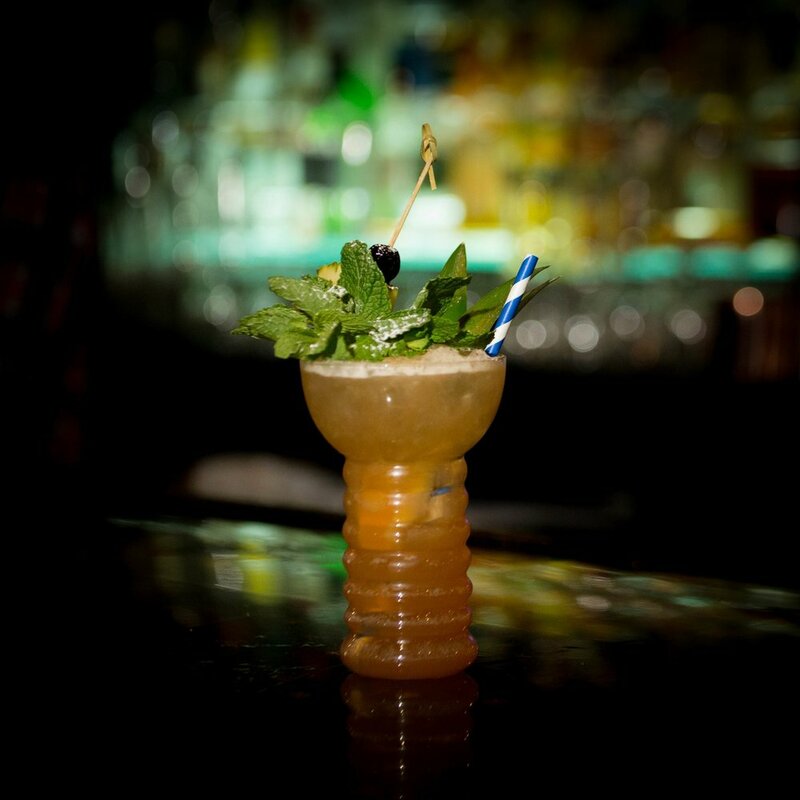 Combine all ingredients in a Pearl Diver or tall glass. • 2. 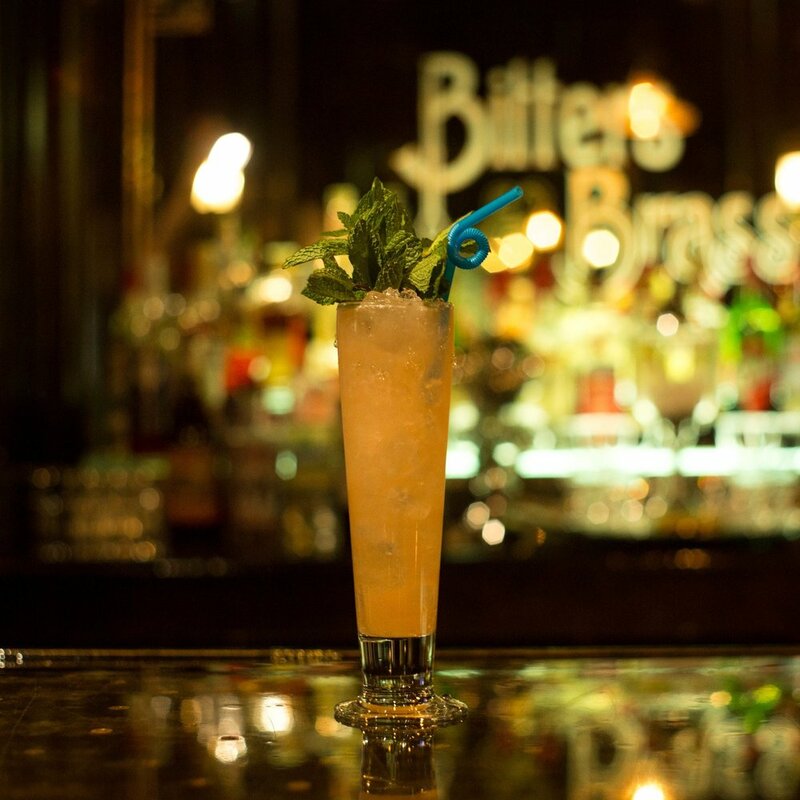 Swizzle with a bar spoon or swizzle stick. • 3. Add more crushed ice. • 4. Garnish with a charred cinnamon stick. • 2. Strain over a coconut water ice cube into a rocks glass. • 3. Garnish with a lime wheel. • 1. In a julep tin, muddle the mint sprig with honey by gently pressing to release the oils. • 2. Pack the tin with finely crushed ice. • 3. Pour Mellow Corn Whiskey over ice, and mound more ice into the top of the tin. • 4. Float .25 oz. Smith & Cross Jamaican Rum over mound of ice. • 5. Garnish with bouquet of mint and charred corn flakes. • 1. In a cocktail shaker, muddle 3 basil leaves with ingredients and shake with ice. • 2. Fine strain into champagne flute. • 1. Add 3 cucumber wheels, a lemon and lime wheel and syrup into a mixing glass and muddle. • 2. Add sherry and ice, shake. • 3. Strain into a cucumber lined pilsner glass filled with crushed ice. • 4. Garnish with seasonal berries, mint and a straw. • 1. Combine all ingredients into a rocks glass over a big ice cube and stir until chilled. • 2. Garnish with an orange peel skewered through a cherry. • 2. Add remaining ingredients in a cocktail shaker and reverse dry shake. • 3. Fine strain into a martini glass. • 4. Garnish with Tejeen. • 1. Combine all ingredients into a cocktail shaker and shake with ice. • 2. Strain into a cocktail glass. • 3. Top with champagne. • 4. Garnish with a strawberry on a pick. • 1. Combine all ingredients into a mixing glass over ice and stir until chilled. • 2. Strain into a coupe glass. • 3. Garnish with basil and a cherry or chocolate. • 1. Combine all ingredients in a cocktail shaker and shake with crushed ice. • 2. Open pour into a pilsner glass. • 3. Garnish with a mint sprig. • .75 oz. Appleton Sig. • 2. Open pour into a hurricane glass. • 3. Top with 2oz cold brew. • 4. Garnish with an edible orchid. • 1. Combine ingredients into a cocktail shaker and shake with ice. • 3. Add ice and top with soda water. • 4. Garnish with baby's breath. • 1. In a julep tin, muddle a mint sprig with syrup. • 2. Add remaining ingredients to a julep tin and pack with finely crushed ice. • 3. Garnish with mint and candied peaches. • 1. In a cocktail shaker, muddle 5 blue berries with orgeat and vanilla syrup. • 2. Combine remaining ingredients into a cocktail shaker and shake with ice. • 3. Fine strain into a cinnamon / sugar rimmed coupe glass. • 1. Combine all ingredients in a Rocks glass over a big ice cube and stir until chilled. • 2. Garnish with a rose bud. • 1. Combine ingredients into a mixing glass over ice and stir until chilled. • 3. Top with Salers Gentiane foam. • 4. Garnish with grated lemon zest. • 3. Garnish with a tarragon leaf. • 2. 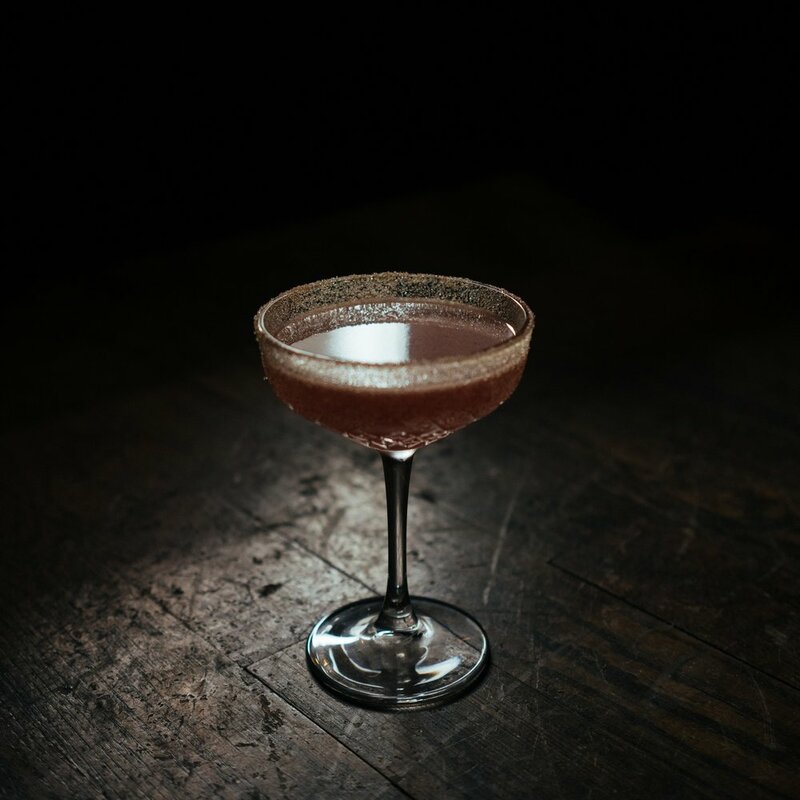 Open pour into a pearl diver glass. • 3. Garnish with grated nutmeg. • 2. Open pour into a napoli glass. • 3. Garnish with mint. • 1. Add ingredients except soda in a cocktail shaker and reverse dry shake. • 2. Strain into a collins glass and top with soda. • 1. Combine all ingredients except Tawny Port into a cocktail shaker and shake with ice. • 3. Float 1 oz. Tawny Port. • .5 oz. Plantation O.F.T.D. • 3. Garnish with long orange peel studded with cloves. • 1. Add ingredients in a cocktail shaker and reverse dry shake. • 2. Strain into a marsala rimmed brandy snifter. • 2. Fine strain into a coupe glass. • 3. Garnish with baby’s breath. • 2. Strain into a champagne flute and top with coconut foam. • 2. Strain into a black pepper / cocoa powder rimmed collins Glass. • 1. Add remaining ingredients in a cocktail shaker and reverse dry shake. • 3. Garnish with an expressed grapefruit peel. • 1. Build ingredients in a rocks glass over a big ice cube and stir until chilled. • 2. Garnish with star anise and a cherry. • 3. Garnish with a smoked rosemary sprig. • 1. Add spirits and gardenia mix to a mug. • 2. Top with hot apple cider and stir gently to dissolve gardenia mix. • 3. Garnish with a clove studded orange peel. • 3. Garnish with a sprig of Thyme. • 1. Muddle 3 cucumber wheels and 1 sprig of mint. • 2. Add remaining ingredients in a mixing glass and stir. • 3. Fine strain into a cocktail glass. • 4. Garnish with cucumber peel skewered through a strawberry. • 1. Combine ingredients in a mixing glass and stir. • 3. Garnish with cherry. • 1. Combine ingredients in a cocktail shaker and shake with ice. • 2. Strain into a Pilsner glass and fill with crushed ice. • 1. Add ingredients to a mixing glass and stir until chilled. • 3. Garnish with a skewered olive and onion. • 1. 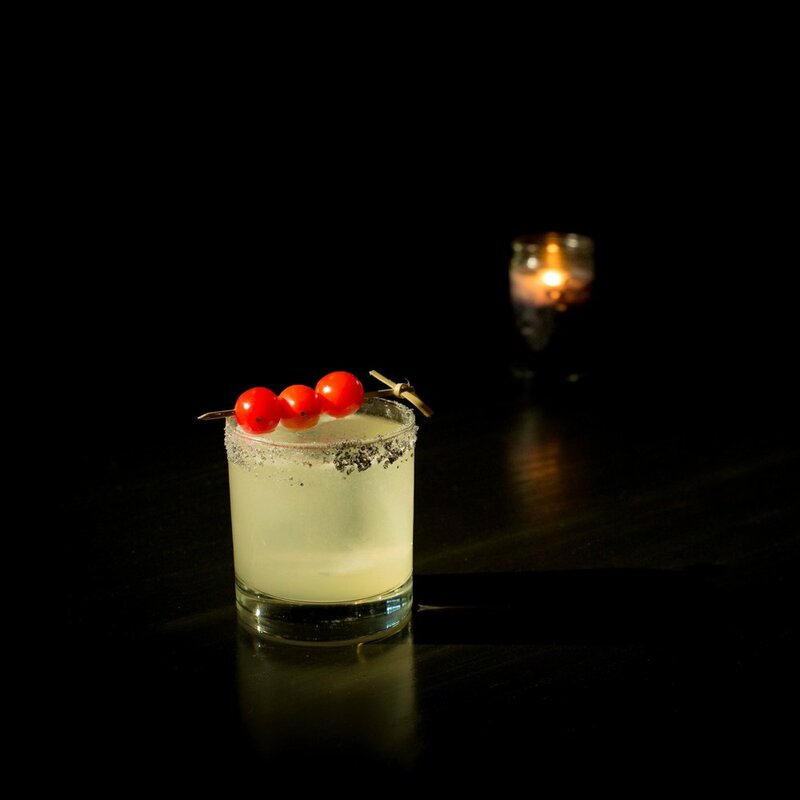 In a cocktail shaker, muddle one quarter tomatillo with a pinch of salt. • 2. Add remaining ingredients and shake with ice. • 3. Fine strain into a lava salt rimmed rocks glass. • 4. Garnish with 3 skewered grape tomatoes. • 1. Add all ingredients to drink mixer tin and blend for 5 seconds. • 3. Garnish with a cherry skewered through a pineapple chunk and a mint sprig.